When we talk about major incident management, we talk about the path from the critical event to its discovery to resolution. But while resolution teams are fixing the car and getting it back on the road, they have other responsibilities to deal with that can impact their ability to resolve issues quickly. Chief among them is keeping non-essential stakeholders informed. In a 2018 survey of 767 IT professionals, the data showed that the impact of keeping stakeholders informed continues to be an issue, but it goes largely undocumented because resolution teams don’t recognize it as part of the resolution process. This disconnect will be a severe limiting factor until teams can figure out how to integrate stakeholder communications into larger incident management processes. 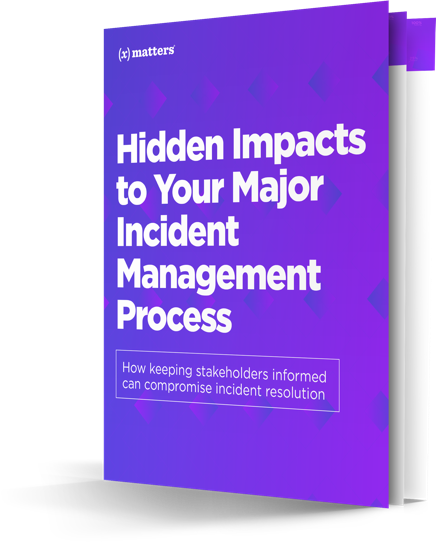 Read the new xMatters guide, Hidden Impacts to Your Major Incident Management Process, to learn how implementing automation to leverage communication tools can take the pain out of incident management and keep your stakeholders happy.